Looking back on my blog this month I feel as if I've spoken quite a lot about makeup or products, for some reason I've had a little extra cash so I have treated myself, but also I think I've been introduced to a lot of new brands which is why I have shared them here! I won't lie I do buy alot of makeup and skincare products, but a lot of the time it's my old faithfuls so I don't find any interest to review them! I mean, I definitely could as a 'my go tos' post, if the idea of finding that out appeals to anyone! I've experimented with my makeup for years and I feel as if I've finally found products which work well with my skin and make me look good. For me makeup is to make me feel good, don't get me wrong I go days without wearing any, but I love the feeling of experimenting with my eye shadows or wearing a dark lip to make myself feel like the true vampire goddess that I deserve to be. SO, Too Faced isn't exactly a new brand to me, I've only tried the odd contouring bronzes of theirs but they're a brand I've been dying to dive into with my purse open for business. They have a number of palettes I've wanted to try, so when my secret Santa (I know it seems way to early for Christmas stuff) at work gifted me this cat eyes palette by too faced!!!! I fell in love. What I love most is the variety in shades but especially because the shimmery shades are all out there! We have an electric light blue called Kitty Glitter which comes off as an ice cold shine, a very 80's inspired pink and a shimmery copper called Tiger's eye which I've pretty much used every day since I received this palette. On the packaging the eye shadow palette states that you can create three distinct looks, an Egyptian inspired golden cat eye, an 80's punky look or a 60's mod! Just to give the palette something extra there is also a guide inside to help you step by step achieve these three looks which is AWESOME! I think this palette is perfect for makeup beginners as you can use the guide, or for me who has been wearing makeup for years, it has such fun colours to really play around with! The black shade Panther is BLACK and I love it to do a gothic smudges eyeliner. As well as having the fun shimmer shades, this palette also has your basic necessity shades like a super pigmented cream shade so you can use it as a base and a paler shade which is called 'Day' to brighten your eyes up. There's so many combinations of shades that you could use together, using three in the row to create each of the look on the box, or an orangly eye with smoked out black for the perfect grungy combo! I'm also a huge fan of the packaging because hello Leopard print! 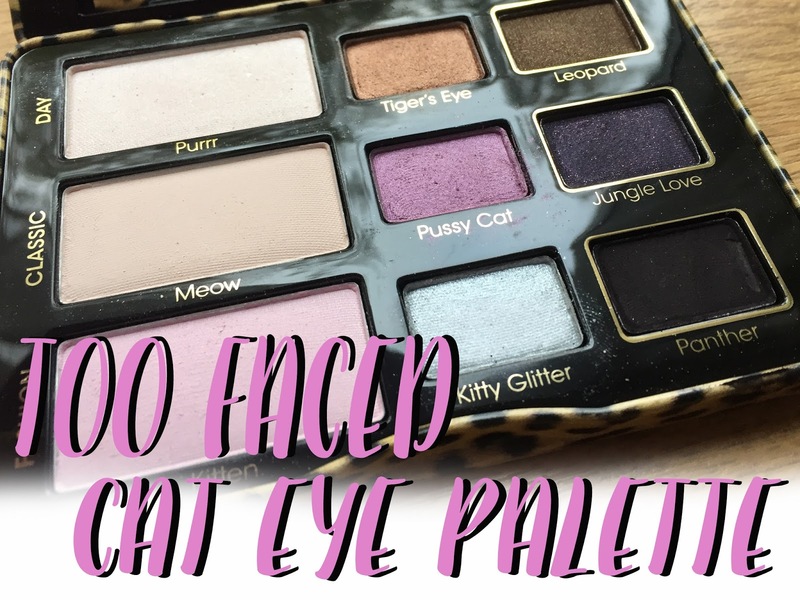 I love that Too Faced have really gone to town with exaggerating the cat eye name! What Too Faced palette would you suggest I try next? I find I always reach for an eye shadow palette more than anything else lately!